Why you run: I run for the health benefits, for the challenge, for the pursuit of goals I once thought impossible, and most importantly, for on-the-move meditation. Running is a time to be with my own thoughts, clearing stress of work and life. On good days, I run. On bad days, I run longer. When did you get started running: After rowing crew in high school, I hiked, backpacked, and enjoyed the outdoors, but dropped endurance sports for a decade. My wife completed a couch-to-Army Ten Miler program in 2007, and I was so inspired watching her and that race, I did the same program the following year. I enjoyed the experience, discovered I was decent at running, and got serious in 2011. Started with just a bunch of half marathons and one marathon a year. One thing led to another, and then it was duathlons, followed by two marathons a year, then multiple marathons, added ultra races, and now there’s always a next distance to conquer. Have you taken a break from running: No. Too many races on the bucket list. Coach or training group: I like the solitude of grinding miles solo, but I stay connected through active social media with Team Nuun, Honey Stinger Hive and other groups. As an RRCA certified coach, I develop my own training, but always consult with others to gain valuable outside perspectives. The hardest race you’ve ever run: Given the snow at the starting line, near-freezing temperatures, sideways rain, and 25+ mph gusts of wind, I should probably say Boston 2018. It was like running through a car wash for three hours…in the winter. But at the same time, it was Boston, so I was smiling in every picture. I didn’t stress about time, enjoyed every moment, and slowed in the middle miles to crush the Newton Hills and go into the pain cave. That said, the walk back to the hotel afterwards was the coldest I’ve ever been. I put my soaking gloves in my mouth to keep my teeth from chattering painfully against each other. And I’d do it all again if I’m so fortunate. 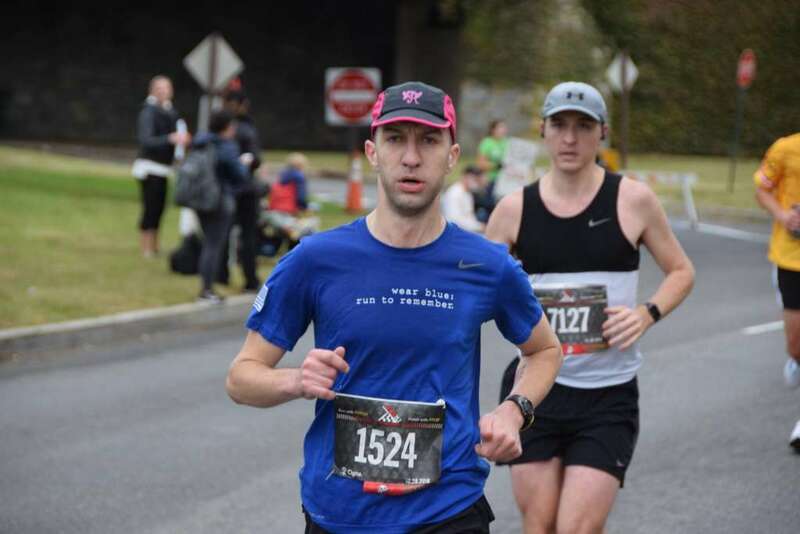 Most adventurous decision you’ve made with your running: Though not adventurous in terms of being risky, I’d say one of the grander decisions I made was to run the three American World Marathon Majors in an 11 month span. It wasn’t always pretty, ran NYC 2017 with a calf strain and Boston 2018 in the aforementioned squalls, but I ended with a great run at Chicago 2018. All three took place in rain and wind, but I got to explore the neighbors and running culture of three great cities in a short period. My best race was: Chicago 2018. My training cycle was below average, conditions were rainy with wind, but it was just one of those running days where the legs feel good and things click. I actually smiled in mile 10 because I knew I had it. Never really hit a wall or suffered until a final-mile hill and wind tunnel. I was able to soak in the final 10 miles, high-fiving kids, thanking every volunteer, pumping up cheering stations, and managed to claim a new PR. Ideal post-run meal: Anything at those magical ultramarathon aid station tables. With a cold beer. Why is the D.C. area a great place to be a runner: D.C. is a fit town with a very active running scene. It has incredible running and cycling routes in the Mount Vernon Trail, the 44 miles of W&OD rail trail, and the 184 miles of C&O Canal. It hosts iconic races like the Marine Corps Marathon, the fourthlargest US marathon, and the JFK 50 miler, the nation’s oldest ultramarathon. DC is an underrated trail town too! With a short trip you can hit miles of single track on the Potomac Heritage Trail and Great Falls National Park; supplemented by regional parks like Burke Lake, Wakefield, Fountainhead, Lake Fairfax, and Hemlock Overlook, many where I cut my teeth on trail running in EX2 Adventures’ approachable 5 and 10 mile race series. In a city that can be divisive and revere power, the running community in DC is welcoming to all; Senators, professional runners, local cross country teams, or just someone running their first mile, all status fades away at the starting line.